Ani Aprahamian, the Frank M. Freimann Professor of Physics, has been elected as Secretary to the International Union of Pure and Applied Physics (IUPAP) Commission on Nuclear Physics. She will serve from January 2018 through December 2020. IUPAP established the commission in 1960 to promote the exchange of information and views among the members of the international scientific community in nuclear physics. Aprahamian studies the evolution of nuclear structure and its impact on stellar and explosive astrophysical processes. She explores how nuclear structure affects nuclear masses, nuclear shapes, decay lifetimes, and probabilities, and how these characteristics influence heavy metal nucleosynthesis and the elemental abundances for the rapid neutron capture process. 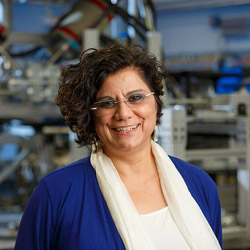 Her work is carried out in Notre Dame’s Nuclear Science Laboratory and in facilities worldwide, including Michigan State University, Argonne National Laboratory, University of Jyväskylä in Finland, TRIUMF in Canada, and RIKEN in Japan. Established in 1922, IUPAP assists in the worldwide development of physics and physics education, fosters international collaborations in physics, and helps in the application of physics towards solving global problems. IUPAP’s work is carried out primarily by 20 commissions that represent the major subfields of physics. IUPAP is the only international physics association that that is organized and run by the physics community. Originally published by Shelly Goethals at physics.nd.edu on November 21, 2017.